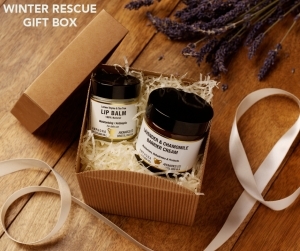 Winter Skin Protection - Winter Rescue Gift Box - Amphora Aromatics Ltd – Supplier of pure essential oils and aromatherapy Products. All this week we’ve been giving you ideas for how you can protect and nourish your skin in the harsh winter weather. Today we highlight our fantastic Winter Rescue Gift Box. With Christmas just around the corner and winter settling in, here's a great idea for a gift for your skin! Our ‘Winter Rescue’ gift box contains two fantastic products - our gorgeous Aromatherapy Lip Balm and a pot of our fantastic Lavender & Chamomile Barrier Cream. Just one of of our range of eight special and affordable Gift Boxes, all of which are currently on special offer (25% OFF!!) until midnight on Monday 1st December 2014. With gorgeous natural ingredients including pure essential oils. This time of year tends to cause dry and cracked lips which can become sore and irritated. This lip balm will offer gentle protection against the cold winds and wet weather. The antimicrobial and antibacterial properties of the essential oils protect and cleanse and can help protect against cold sores. The base of beeswax makes it an wonderfully effective moisturiser to keep your lips hydrated and healthy. This gorgeous product contains a glorious array of natural ingredients to offer ultimate protection for your skin. Nourishing and hydrating Lavender and Chamomile essential oils, along with moisturising and protecting Coconut oil, Beeswax and Sweet Almond oil. And there’s more! It also contains Avocado, Sunflower and Wheatgerm oil. This cream really is abundant with great natural ingredients for the skin! Perfect for use on the whole family. Apply before and after going out into the cold or spending time in the garden, on babies bottoms (over 3 months), to protect your hands and face from the elements or to soothe and relieve insect bites, scratches and stings. It's a truly versatile product. Lavender and Chamomile offer gentle protection to the skin with their anti-inflammatory properties. Both oils are well loved for their ability to calm, soothe and protect the skin. This gorgeous Gift Box is normally £7.96 but is currently available for just £5.96 as part of our Black Friday Cyber Monday Weekend Event. Click here to see the Gift Box, or here to see all the products included in this special promotion.